For the past few weeks, I have had conversations with my co-workers as to what they felt was the most significant issue when dealing with large-scale projects. For most, stress was the No. 1 issue they felt needed to be addressed at both the executive and departmental manager levels. 1. Excessive high workloads with unrealistic deadlines made co-workers feel rushed, under pressure and overwhelmed. Recommendation: Make sure targets are challenging but realistic and assignments are communicated as clearly as possible. Help your employees prioritize their work, cutting out unnecessary tasks. Encourage delegation of work where possible. Strongly encourage employees to not skip lunches or breaks to meet the coming deadlines. Convey and get the message out there that it is OK to get up and walk around the office, take a walk outside and get away from your desk. Ordering lunch for employees every once in a while or providing snacks can go a long way in reducing stress. 2. Workers felt their skills were underutilized or they were asked to do a job for which they did not have sufficient experience or training. Recommendation: Check that individuals are well-matched to the jobs you give them. Make sure every employee has a well-defined role and they know what it is. Allowing staff to take responsibility and make decisions on their own will boost employee self-confidence. The greatest gift a manager can give to themselves and their staff is to the power to stretch and grow. Empower your employees to reach their full potential by knowing your people and know their baseline of knowledge, skills, abilities, strengths and desires. Give your employees the opportunity and permission to succeed in their unique style. Let them be themselves. 3. Lack of autonomy or control over their work activities in relation to the project. Recommendation: Where possible, give employees more autonomy. Allow them to plan their work schedule and decide how to tackle problems. Consider flexible work hours. As a manager, try not to infringe on your employees time off or after work hours by calling them, emailing them or sending work. Employees like to know they are capable and can do the job, but they also want their colleagues to know it too. It can be a challenge, but as a manager, there are times you can hand over the authority wand and let others lead. 4. At times, employees in my organization feel a lack of interpersonal support or working relationships across departments, especially during large projects. In addition, multiple reporting lines became overwhelming as each manager asked for their work to be a priority. Recommendation: Adopt a management style that encourages employees to discuss problems with you. Provide them with opportunities to give feedback or express ideas about their work. Have face-to-face meetings instead of discussing concerns and conflicts via email. Meeting face-to-face conveys the fact that you care about what the person has to say. You value them and are willing to take time during your day as a leader with them. Another key to good communication is reflecting back to people what they have said so they see that you listened and you understand. Validate the feeling behind the request, even if you don’t have an immediate solution. Ask the employee for suggestions of a solution. 5. Sometimes, the lack of direction from management on projects left employees feeling the organization has a “blame culture” where people are afraid of getting things wrong or admitting to making mistakes. Recommendation: It is important to coach and train managers on having reasonable expectations of employees. As a leader, you need to be the example. Stop complaining and finger-pointing. Do not let your employees see you engaged in this behavior. Focus on system flaws rather than people flaws. Make the complainer part of the solution and show them you are concerned about fixing the problem. Do not let blaming reach beyond your department. Create an environment in which people are encouraged to give you feedback on your performance. You must also provide them with honest feedback and encourage them to do the same among one another. Continual feedback will keep you keenly aware of the effect your actions have on others around you. It will also help prevent you from becoming a target of blame. Anyone who has ever worked on a project has, at some point, felt the pressure of work-related stress. Any job can have stressful elements, even if you love what you do. 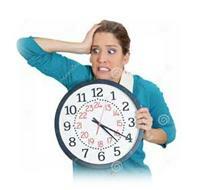 In the short term, you may experience pressure to meet a deadline or fulfill a challenging obligation. However, when work stress becomes chronic, it can be overwhelming and harmful to both physical and emotional health. As a leader, you are in a unique position to help minimize job stress.